Dalen is the destination you reach at the end of the long Telemark Canal in southern Norway. In the near future, a sauna will be spreading a golden glow in the dark out on the deep Bandak fjord. ÅF Lighting has been invited to support regional efforts to make the journey along the canal more attractive, and has been awarded the opportunity to work with the magical contrasts of darkness and light. Dalen is the destination you reach at the end of the long Telemark Canal in southern Norway. 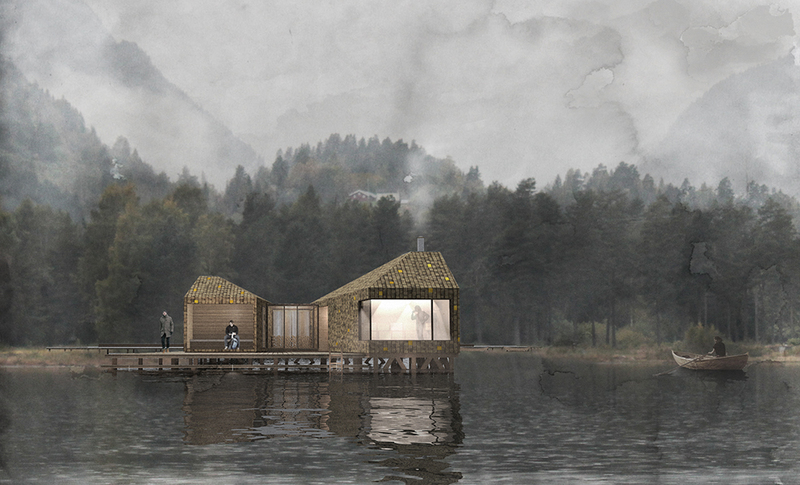 In the near future, a levitating sauna will be spreading a golden glow in the dark out on the deep Bandak fjord. ÅF Lighting has been invited to support regional efforts to make the journey along the canal more attractive, and has been awarded the opportunity to work with the magical contrasts of darkness and light. For Dalen, lighting design is highly prioritized and the municipality demanded that a lighting designer would take part from the beginning of the design process when modernizing the canal voyage. Together with a multidisciplinary, Nordic design team, our lighting designer Tobias Olsson developed the concept behind the golden sauna – Soria Moria. The idea is to create a shining gem on the water, attracting attention and creating curiosity. A coming together of art, nature and architecture. Although the building is comparatively small, it will be an important link for visitors and citizens to get in touch with the surrounding mountains and water. The goal is to create a landmark that will bring people together and evoke lasting memories. It should be versatile to function as a place for contemplation as well as well as a place for social measures. “My part of the concept involves preserving the darkness and the natural light, in order to create something that is one with nature. Once you are inside the sauna, you have a front row seat to a grand drama in which the landscape itself has the leading role. The lighting design emanates from the surrounding nature, its tranquility and sense of magic”, explains Tobias Olsson. The old Norwegian legend of Soria Moria tells how the golden castle of the trolls can sometimes be glimpsed in the distance as the last rays of the sun touch the magnificent mountain peaks. The completion date for the Soria Moria of Dalen is set to next year, when the region celebrates its 125th anniversary. For more information, Contact Tobias Olsson.